Copenhagen Ultracontemporary Streaming Biennale announces the next exhibition in the streaming biennale program. From September 4, 2016, to January 15, 2017, the biennale founder and the format artist Thierry Geoffroy/ COLONEL is exhibiting at Worker’s Museum as part of the exhibition "Community and solidarity in contemporary art!” (in Danish: En blank og vårfrisk dag”). The exhibition is curated by Kasper Lynge Jensen and the participating artists are Kristian Falsnæs (DK) Gitte Juul (DK), Gavin Turk (UK), Emil Elg (DK), Hesselholdt & Mejlvang (DK), Thierry Geoffroy (FR/DA), and Mads Westrup (DK). Thierry Geoffroy/ COLONEL contribution to the exhibition is called #NOWBEFOREITISTOOLATE and is divided into two parts. One of them is setting the scene for the other one, which is the pulsing and involving part. The exhibition consists of different media artworks all thematically interconnected and questioning the potentiality of art to be the generator for critical thinking and willingness to make a change in the world. Can art stimulate an audience of viewers to react and become active contributors to a protest demanding reform? Is it possible to transform a regardeur into a protesteurs? As part of his wider artistic praxis Thierry Geoffroy/ COLONEL reflects on time; on art being in time, art being too late as well as art being in advance and preventing accidents. In this exhibition he is respectably through a lens of past, present and future creating a picture, a landscape or a backdrop for action to take place. Past: Thierry Geoffroy/ Colonel has since 1988 been working with art formats that aim to create communities and art movements driven by the vision of creating awareness about dysfunctions in the world through art. For this exhibition, he is “Protest Scenographer” - a video artwork created during Roskilde Festival in 2006, where he positions himself as a protest scenographer. He develops a protest scenography in order to stimulate festival guests to march together and protest with slogans about what they consider being emergencies. In groups, carrying self-made banners and singing their own self-composed protest songs the groups of young people move around the festival area expressing together about their shared opinions. Present: After working 20 years with emergency art, the artist is now having doubts about a possibility for change, disbeliefs in the efficiency of his art and pessimistic thoughts about the actual situation in the world. He also points at apathy as a dangerous epidemic in our society, to which we need to find a cure. He sees art as a possible antidote to apathy poison. During the exhibition period, the museum becomes a laboratory for studying our condition and trying to understand how we got contaminated by apathy as well as how we could get protected in the future. The artworks on apathy and doubt include neon artworks with #, paintings, and banners primarily based on statements that make us reflect on questions such as: Should we give up the fight because it already seems lost? Do we (as citizens) have the right to turn our backs to world problems just because the solutions seem difficult or almost impossible? How to continue when defeat appears? Most of the signs such as The Awareness Muscle has to be trained every day, are Thierry Geoffroy/ COLONEL’s handwriting. The style he uses on tents or cartons too. Some of the works include a hashtag; like #coolness is our defeat. The hashtag is used by the artist as a poetic element and as one of the keys for circulation of words on Internet. The sign NOW is now has an additional element connected to the anatomy of neon light. The tube is transparent and it is possible to see the gas used to produce the light. The first word "NOW" is blinking in the heartbeat rhythm, giving the impression of the artwork being alive. Slogans folded in neon light is a way of reminding the viewers to be alert. The neon light is often used in advertising to call for attention and action. It has, as such a strong communicative connotation based on efficiency. We assume that artworks are able to wake up the audience, to make them think and take an action. Opposite to the neon light artworks, there is the active part of the exhibition, where the artists daily can express their critical opinions. Future: To do a future directed project Thierry Geoffroy/ COLONEL is introducing a new painting series called #actiondatepaintings. Each painting is a date for a rendez vous for future actions painted on a canvas. Like art a retardement, the effect of the artworks is being programmed to take place in the future. The usage of # moves the life of this artwork from the museum room to the internet where the rendez vous date can become a chain on-line communication circulated globally with a #. De toile en toile (from canvas to the internet) is not only a word play for Thierry Geoffroy/ COLONEL, it is also a continuation of a reflection on what is the painting and its potential as a metaphor for contemporary art. 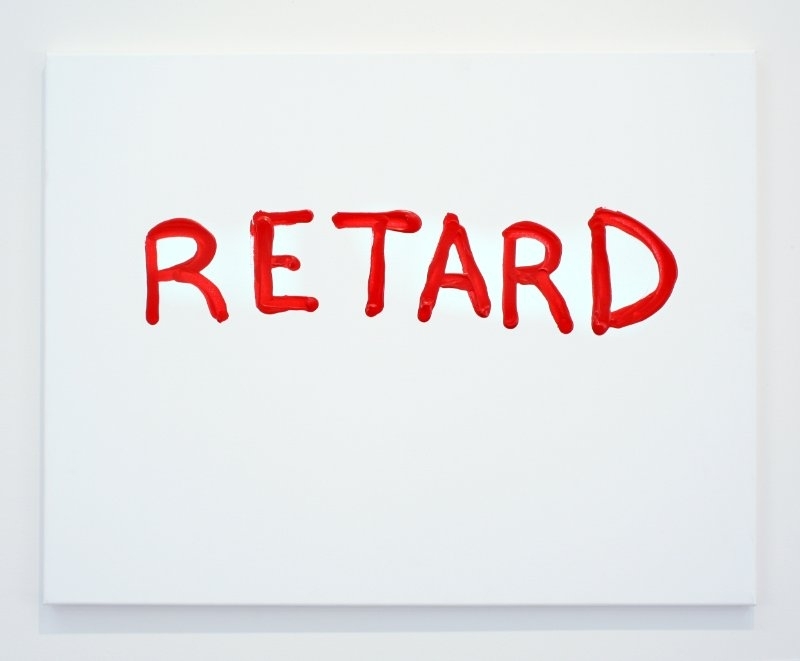 Already in his earlier works such as Too Late and Retard, the canvas has been used to question the ability of contemporary art to be in time. For this series, the artist chooses a less defeatist approach to the potential of art to gather people around a projected goal. The canvas, in this case, becomes a tool for communicating a prospect and anticipating hope that can get people together, very similar to the way banners are used in protest movements. Can a # on canvas gather people in a collective action? The idea of artists opening their spaces to each other is based on importance and necessity of communicating in time and an acknowledgment that the emergencies are requesting immediate attention. The concept of flexibility in sharing exhibition space can be further developed into a global movement; an international community of artists who are willing to share part of their exhibition spaces whenever other artists need to express about emergency issues. The opening exhibition concept is part of the Manifeste Moving Exhibition 1989 (part of The Moving Exhibition de type semi bourgeoise conviviale) The artist’s essential idea behind the movement is described in the Emergency Room dictionary as PENETRATION. Thierry Geoffroy, also known as COLONEL, is a French artist, living in Copenhagen, Denmark. He is a format artist developing art formats, most known being EMERGENCY ROOM, BIENNALIST and CRITICAL RUN. Thierry Geoffroy / COLONEL has published 6 books and his artworks are included in international museum collections. He is Chevalier de l’ordre des Arts et des Lettres. P.S.1/ MOMA New York, USA; ZKM Museum Karlsruhe, DE; Sprengel Museum, Hannover, DE; Moderna Museet, the Museum of Modern Art, Stockholm, SE; HEART- Herning Museum of Contemporary Art Denmark, Herning, DK; Plazzo Delle Arti Napoli, IT; The Museum of Contemporary Art, Roskilde, DK; Galerie Asbaek Copenhagen, DK; The Maldives Pavilion, Venice Biennale, Venice, IT; Liverpool Biennial, Liverpool, UK, Manifesta Biennal, Murcia, ES; National Museum Rejkavik, FI; Galerie Olaf Stüber, Berlin, DE, IKM Museum, Oslo, NO; Fries Museum, Leeuwarden, NL; Devron Arts, Huntly, Aberdeenshire, SCO; The Model, Sligo, IR; Fotografisk Center, Copenhagen, DK; Cairo Biennale, Cairo, EG; Blackwood Gallery Toronto, CAN; Galerie Ileana Tounta, Athens, GR; Kunsthalle Osnabrück, Osnabrück, DE. Article in the Danish art newspaper Kunstavisen.